This is a guest post from Tim Anderson, a middle school English teacher and Google Certified Educator at Sulphur Springs Elementary School in Jonesborough, Tennessee. There often seems to be a disconnect between students and historical events. Connecting literature to history helps make it come alive for students. 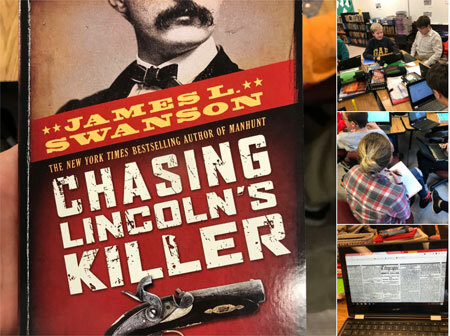 Since my eighth graders are studying the Civil War, I chose to have them read Chasing Lincoln’s Killer, a fast-paced thriller about the pursuit and capture of John Wilkes Booth pieced together from primary sources. While many students are aware of President Lincoln’s assassination, this book gives students a different perspective on the assassination and not only gives them deeper background knowledge of major historical events but also provides them with opportunities to put data into chronological order and to identify factual evidence for use in writing. I used primary sources and other secondary sources throughout the unit to facilitate time travel and help my students connect to the people living in the time of Lincoln. To further personalize the learning and make it more relevant to students, I decided to have them use technology to fuse past and present. Their goal was to create a television newscast about President Lincoln’s assassination. The connections the students made to the time period and the events was amazing. The Lincoln assassination timeline and selected newspaper articles from the Chronicling America collection on the Library of Congress website was fantastic. The ease of use was phenomenal and students immediately began clicking through the articles to find information. Having easy access to the primary sources from the Library really helped to facilitate the project and allowed me to focus more on other parts of the assignment. Students who had previously shown little interest in informational texts took the assignment and called it their own. One student student literally could not put down an historical newspaper account about the standoff at the barn between Booth and law enforcement. Amazed by the graphic depiction of events, the student went on to easily incorporate direct quotes from the article in his news script. Students synthesized information from the primary sources and the book to create a product that accurately represented history but allowed them to put their own unique spin on the presentation. Students filmed their newscasts using iPads as some took on the role of anchors in the studio and others became reporters in the field. This project enabled students to progress through the full triangle of Bloom’s taxonomy, organically reaching high levels of thinking. Additionally, it was a big hit with students and increased engagement in history class as well. I can’t wait to do it again next year! 8.RI.KID.3: Analyze the techniques used to distinguish between and to make connections among individuals, events, or ideas in a text. 8.RI.IKI.9: Analyze a case in which two or more texts provide conflicting information on the same topic and identify where the texts disagree on matters of fact or interpretation. Today in History: Lincoln Shot! Great activity. As I read this post I wondered if anyone had created a “Choose Your Own Adventure” using primary sources? Sounds intriguing Ruth! Any ideas?